In the early 1970s, a craze for kung-fu movies out of Hong Kong swept through the United States, fueled largely by the sudden stardom of legendary martial artist Bruce Lee. The craze was actually fairly new to Hong Kong itself, as martial arts films (called "wuxia" films in Chinese) had only gained prominence there in the mid-1960s. Two major film studios, Shaw and Golden Harvest, responded to the insatiable demand by pumping out dozens of films a year, with the genre reaching a peak in the mid-70s although such films continue to be quite popular to this day. 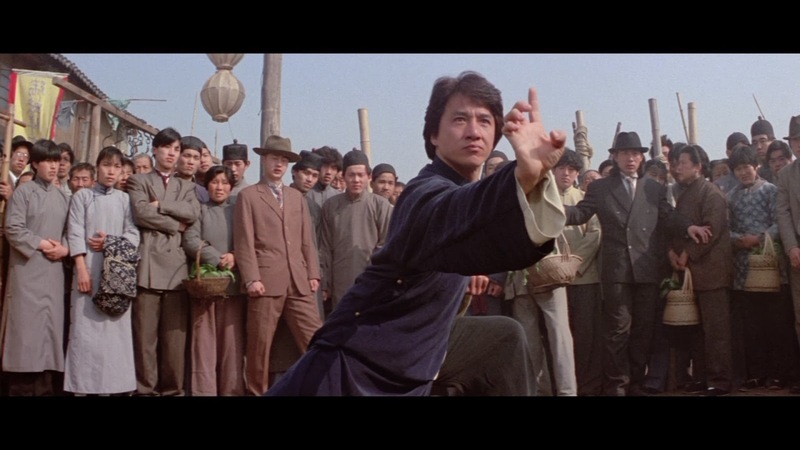 The vast majority of wuxia films focus solely on the fighting sequences, to the extreme detriment of the plot, dialogue, characters, or acting; in addition, many of the original kung-fu movies of the 70s are frequently parodied for their hilarious mis-dubbed voices in broken English. THE CHINESE CONNECTION (1972): This film, known as Fist Of Fury in Hong Kong, was Bruce Lee's second major film, and the one which catapulted him to superstar status both at home and abroad. Its tale of a wuxia student in Shanghai during the 1930s who vows revenge on the Japanese martial arts school which poisoned his master, stoked anti-Japanese sentiment still running strong in the Chinese community after Japan's occupation of the country during WWII. Americans, however, found much to marvel at in Lee's almost superhuman fighting skills, which were compounded by some of the best fight choreography seen in any film, martial arts or otherwise. A scene at the Japanese school in which Lee single-handedly takes on an entire class of students, is one of the most iconic in kung-fu cinema. 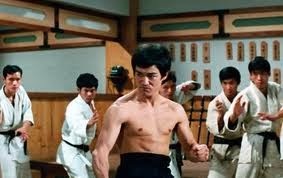 Lee would go on to even greater success with his Hollywood film, Enter The Dragon (1973), but it's The Chinese Connection which features him at his most potent. THE MASTER OF THE FLYING GUILLOTINE (1976): Considered one of the greatest films to emerge from the initial wave of 70s kung-fu exploitation films, Flying Guillotine stands out thanks to a plot that centers around a martial arts tournament, in which a number of different kung-fu styles are displayed and pitted against each other. The film is also known for its villain, the blind master of the flying guillotine himself who is played to perfection. Quentin Tarantino has named this one of his all-time favorite films, and cites it as the primary inspiration for his Kill Bill series (see below). THE 36TH CHAMBER OF SHAOLIN (1978): one of the first Hong Kong wuxia films to be shot in mainland China, 36th Chamber became renowned for its unusually fine production standards and acting. A young rebel against the Manchu government seeks refuge in a Shaolin temple, where he slowly rises through all 36 "chambers" or classes of martial arts training that are offered, each chamber more difficult than the last. The personal transformation of the character is almost as fascinating as the dazzling martial arts sequences; this is certainly the finest and most well-known film to come out of the famed Shaw Brothers studio. DRUNKEN MASTER II (1994): In 1978 Jackie Chan became the biggest martial arts star since the late Bruce Lee, in a film named Drunken Master which--as indicated in the title--featured the visually entertaining "drunken" style of boxing, in which the martial artist's movements are deceptively slowed down as if intoxicated. It took 16 years to produce a sequel, although it turned out superior to the original, and is this site's pick for the definitive Chan film. Forget about the plot--this one's all about Jackie's extraordinary skills, in which he also happens to choreograph and perform his own stunts. Drunken Master II was also one of the last films Chan made in Hong Kong, before a lucrative Hollywood career beckoned. The Hollywood films were successful, but their focus on comedy de-emphasized Chan's greatest strengths. CROUCHING TIGER, HIDDEN DRAGON (1999): The world's premier "kung-fu chick flick" was a sensation at the box-office, becoming the highest-grossing wuxia film up to that point in time. Crouching Tiger revolutionized the industry, as it took it out of the exploitation genre and turned the kung-fu film into a sumptuous artistic feast, with heavy emphasis on lush production values and A-list direction (Taiwanese director Ang Lee would go on to direct many acclaimed, Oscar-nominated films and eventually win for both Brokeback Mountain and Life Of Pi). The film's romantic subplot ended up attracting many female viewers to this normally male-dominated genre, which was not lost on the many copycat films that followed in its wake, including the equally-superb House Of Flying Daggers (2004). 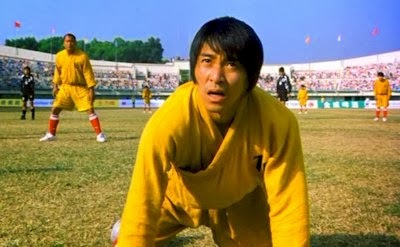 SHAOLIN SOCCER (2001): Writer/actor/director Stephen Chow had been making extremely silly--and extremely clever--kung fu comedies through the 1990s when he shot Shaolin Soccer, which quickly became the highest-grossing film in Hong Kong history. This film, which focuses on a downtrodden martial artist who attempts to reunite his estranged brothers in a soccer team that will use their kung-fu skills to win the final tournament, is a laugh riot from beginning to end. It also established Chow's reputation in the United States, where he achieved a measure of mainstream success with the followup Kung Fu Hustle. It is Shaolin Soccer, however, which remains his masterpiece. KILL BILL, VOL.1 (2003): We end our kung-fu odyssey with Quentin Tarantino's loving tribute to the original 70s films (ie. Master Of The Flying Guillotine) that had entranced him while growing up. The two-part film was divided into an action half (Vol.1) and a drama half (Vol.2). While Vol.2 is also highly recommended, Vol.1 is where most of the action is. Tarantino brings all of his unique, postmodern pop-culture dialogue and directorial skills to bear in a classic revenge-oriented plot that even features an extended Manga-style animation sequence. 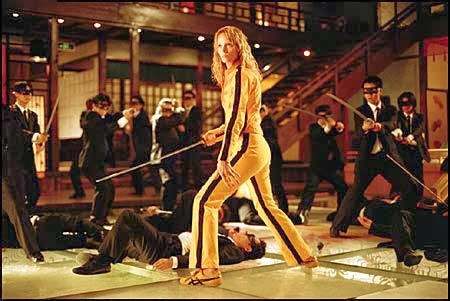 The climax of the film, in which Uma Thurman's "Bride" character single-handedly defeats hundreds of Japanese attackers, is directly reminiscent of Bruce Lee's scene in The Chinese Connection and now brings us full circle.